In first part of our multi-part blog series about 3scale policy development we looked into the setup of a development environment. Now we have a functioning development environment we can start the actual development of the 3scale policy. In this part we will take a look and use the scaffolding utility provided by APIcast to generate a policy scaffold. The first thing we are going to do is create a new git branch of the APIcast source we have cloned in the previous part. This is an optional step, but developing a new feature or changing code in general in a new branch is a good habit to get into. So create a new branch and start up our development container. To generate the scaffold of our policy we can use the apicast utility located in the bin/ directory of our development container. where hello_world is the name of the policy. So the policy scaffolding utility not only generates a scaffold for our policy, but also the files for a configuration schema, unit tests and integration tests. Let’s have a look at these files. The source code of our policy residing in the directory src/gateway/apicast/policy/hello_world contains three files. init.lua – all policies contain this init.lua file. It contains 1 line importing (require in Lua) our policy. It should not be modified. aplicast-policy.json – The APIcast gateway is configured using a json document. Policies requiring configuration also use this json document. The apicast-policy.json file is a json schema file were configuration properties for the policy can be defined. 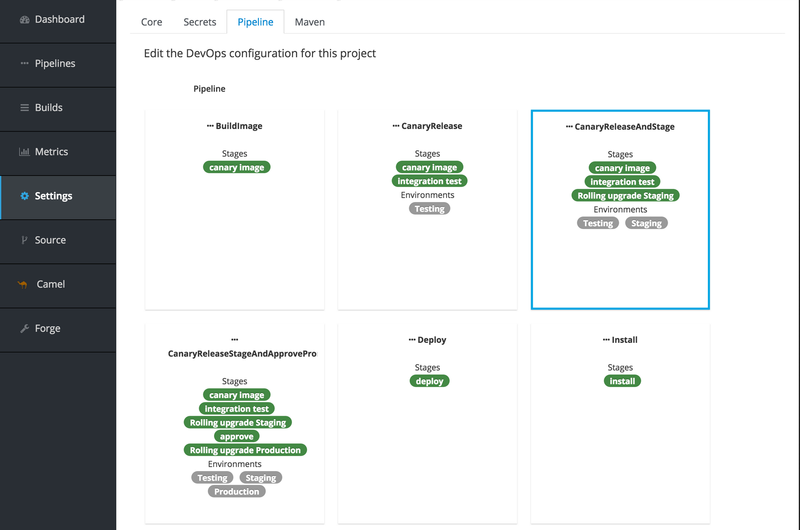 We will look into configuration properties and this file in more detail in our next part of our policy development blog series. hello_world.lua – This is the actual source code of our policy, which at the moment does not contain much. -- This is a hello_world description. -- @tparam[opt] table config Policy configuration. The first two lines import the APIcast policy module an instantiate a new policy with hello_world as an argument. This returns a module itself which is implemented using a Lua table. Lua is not an Object Oriented language from itself but tables (and especially metatables) can mimic objects. The third line stores a reference to a function new which is defined below. The new function takes a config variable as argument, but as of now nothing is done with is. The new method simply returns itself. Finally the module representing our policy is returned. This is done so other components importing this policy module retrieve the table and can invoke all functions and variables stored in the policy. We won’t cover all the files in details here since we are going to touch these in upcoming series when we flesh out our policy with functionality. But as a final verification to see if we have something working let’s run the unit tests again. The keen observer can see the number of successes in the unit test outcome has increased from 749 to 751 after we generated the scaffold for our policy. In the next part we will take a closer look at the json configuration schema file and how we can read the configuration values from the json configuration as well as ENV vars to use in our policy. In this multi part blog series we are going to dive into the development, testing and deployment of a custom 3scale APIcast policy. In this initial part we are going to setup a development environment so we can actually start the development of our policy. But before we begin, let’s first take a look what a 3scale APIcast policy is. We are not going into too much detail here, since better and more detailed descriptions about 3scale APIcast policies already exist. For those unfamiliar 3scale is a full API Management solution of Red Hat. It exists of an API Manager used for account management, analytics and overall configuration. A developer portal used for outside developers for gaining access to API’s and viewing the documentation. And the API gateway named APIcast. The APIcast gateway is based on Nginx and more specifically Openresty, which is a distribution of Nginx compiled with various modules, most notable the lua-nginx-module. 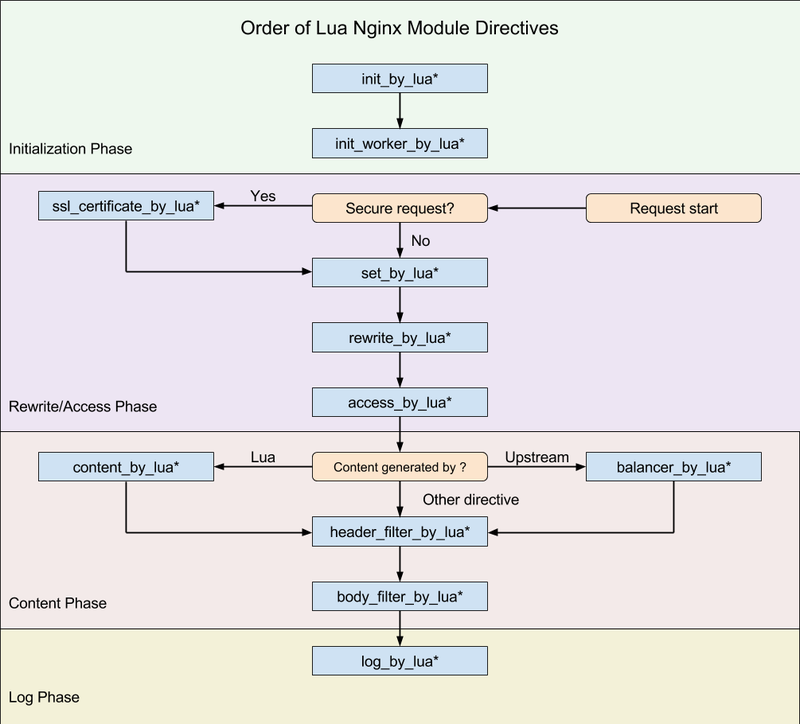 The lua-nginx-module provides the ability to enhance a Nginx server by executing scripts using the Lua programming language. This is done by providing a Lua hook for each of the Nginx phases. Nginx works using an event loop and a state model where every request (as well as the starting of the server and its worker processes) goes through various phases. Each phase can execute a specific Lua function. As was clear from the introduction, APIcast policies are created in the Lua programming language. So we need to setup an environment to do some Lua programming. Also, an actual APIcast server would be very nice to perform some local tests. Luckily the guys from 3scale made it very easy to setup a development environment for APIcast using Docker and Docker Compose. This means both Docker and Docker compose must be installed. Instructions for installing Docker can be found on the Docker website. Instructions for installing Docker-compose can also be found on the Docker website. Now that we have both Docker and Docker-compose installed we an setup the APIcast development image. Firstly the APIcast git repostitory must be cloned so we can start the development of our policy. Since we are going to base our policy on the latest 3scale release we are switching to the stable branch of APIcast. The Docker container starts in the foreground with a bash session. The first thing we need to do inside the container is installing all the dependencies. This can also be done using a Make command, which again must be issued inside the container. It will now download and install a plethora of dependencies inside the container. Now as a final verification we can run some APIcast unit tests to see if we are up and running and ready to start the development of our policy. Now that we can successfully run unit tests we can start our policy development! The project’s source code will be available in the container and sync’ed with your local apicast directory, so you can edit files in your preferred environment and still be able to run whatever you need inside the Docker container. The development container for APIcast uses a Docker volume mount to mount the local apicast directory inside the container. This means all files changed locally in the repository are synced with the container and used in the tests and runtime of the development container. It also means you can use your favorite IDE or editor develop your 3scale policy. The use of an IDE or text editor and more specifically which one is very personal so there is definitely no one size fits all here. But for those looking for a dedicated Lua IDE ZeroBraneStudio is a good choice. Since I come from a Java background I am very used to working with IntelliJ IDEA, and luckily there are some plugins available that make Lua development a little bit nicer. 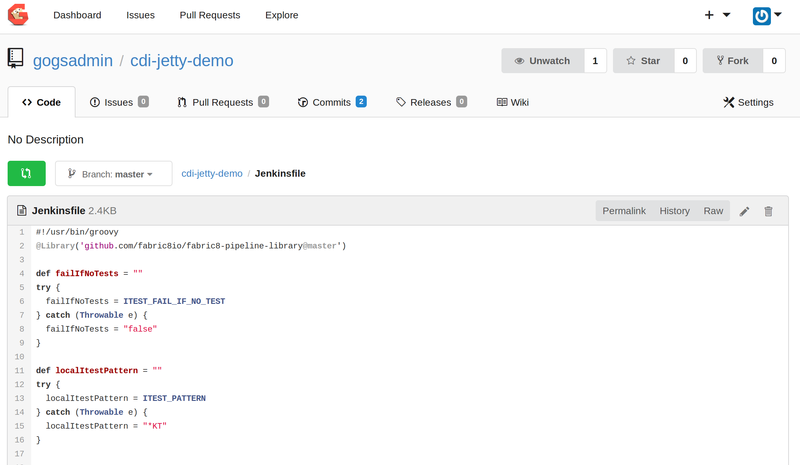 As a final step, but this is more relevant if you are also planning on developing some Openresty based applications locally (outside the APIcast development container), you can install Openresty, based on the instructions on their website. What I did was I linked the Lua runtime engine of Openresty, which is LuaJIT, to the SDK of my IntelliJ IDEA so that I am developing code against the LuaJIT engine of Openresty. As I already mentioned these steps are not required for developing policies in APIcast, and you definitely do not need to use IntelliJ IDEA. But having a good IDE or Text editor, whatever your choice, can make your development life a little bit easier. Now we are ready to create a 3scale APIcast policy, which is the subject of the next part! 3Scale is an API Management platform used for authenticating an throttleing API calls among many, many other things. Now when thinking of API’s most people think of RESTfull API’s these days. And altough 3Scale primarily targets RESTfull API’s it is also possible to use other types of API’s as this blog will demonstrate. 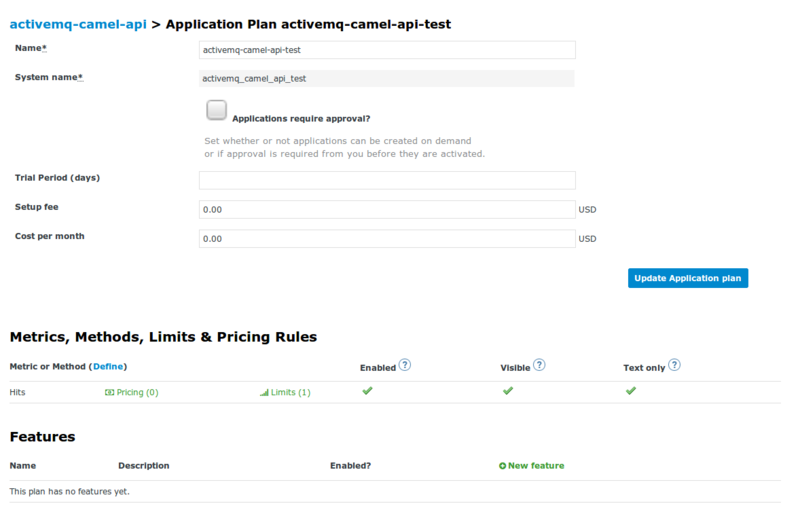 In this post we will use a Camel JMS subscriber in combination with ActiveMQ and authenticate requests against the 3Scale API Management platform. First let’s look at the 3Scale setup. The first step is to create a new service, however normally one would select one of the APICast API Gateway options for handling the API traffic. 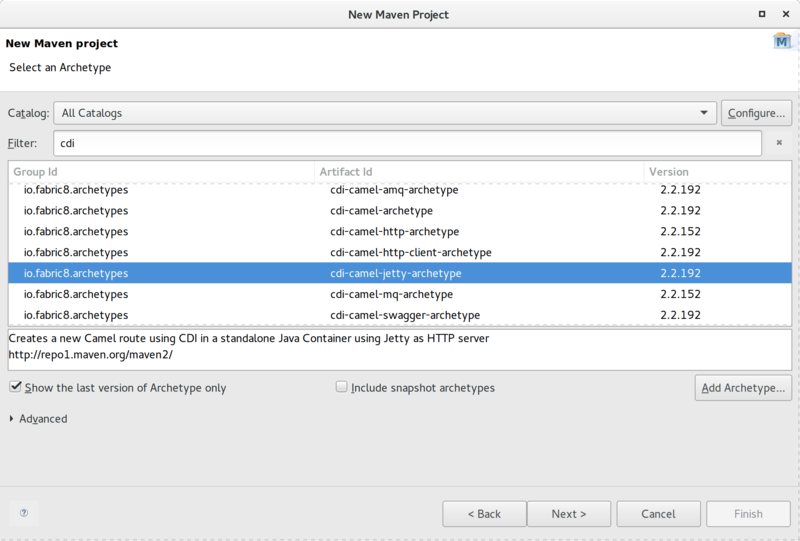 This time however we are selecting the Java plugin option, since Camel is based on Java. Obviously the same principles could be applied in one of the other programming languages for which plugins are available. The next step is to go to the integration page. But, where normally we would configure the mapping rules of our RESTfull API, we now get instructions to implement the Java plugin. It is good to note the rest of the 3Scale setup is completely default. De default Hits metric is used as shown below, although custom methods could easily be defined. For this example one application plan with a rate limit has been configured. 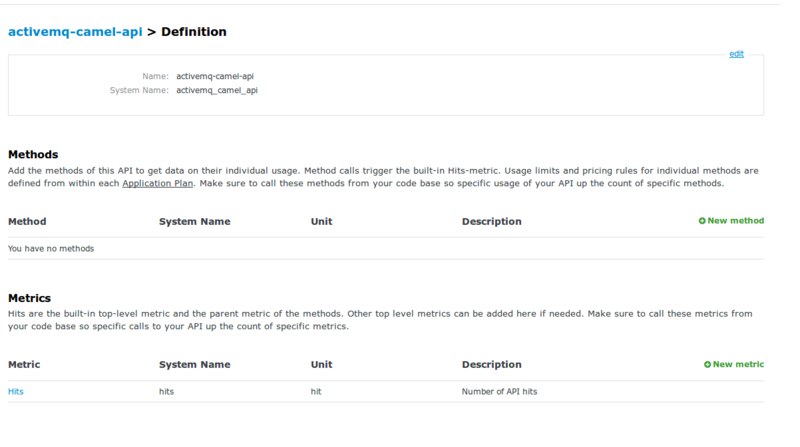 Apache Camel has numerous ways of integrating custom code and creating customizations. For this example a custom processor is created, although a bean, or component would work also. Now we can integrate the 3Scale Java plugin in our Camel processor, which is going to retrieve the 3Scale appId and appKey, used for authentication from JMS headers. With the appId and appKey the 3Scale API is called for authentication. However this is not the only thing we need to pass in our request towards 3Scale. To authenticate against 3Scale selecting the correct 3Scale account and service we need to pass the ServiceId of the service we created above and pass the accompanying service token. Since these are fixed per environment we retrieve these values from a properties file. Finally we need to increment the hits metric. Once all these parameters are passed in the request we can invoke 3Scale and authenticate our request. If we are authenticated and authorized for this API we finish the processor, following the Camel Route execution. However, when we are not authenticated we are going to stop the route and any further processing. 2018-03-10 20:28:40,295 [cdi.Main.main()] INFO  DefaultCamelContext            - Total 1 routes, of which 1 are started. Now this processor discards the message when the authentication by 3Scale fails, but it is off course possible to send the unauthorized messages towards a special error queue, or make the entire route transactional and simply do not send an ACK when authentication fails. The entire code of this example is available on Github. Serverless architecture, what is it? One of the more recent trends in IT is Serverless architecture. Like any hype in the earlier stages a lot of ambiguity exists on what it is and what problems it solves. Serverless architecture is no different. So recently a collegue of mine Jan van Zoggel (you can read his awesome blog here) and I took a look at what Serverless architecture is. The Serverless trend emerged, like so many others these days, in the realm of web and app development. Where all logic and state traditionally handled by the backend was placed is a “*aas” (as a service) which got the term BaaS or mBaaS (mobile)Backend as a service. Meanwhile Serverless also got to mean something slightly different, which of course got another “*aas” acronym, FaaS. Or Function as a Service. In FaaS certain application logic (Functions) run in ephemeral runtimes, in the cloud where the cloud provider in question handles all runtime specific configuration and setup. This includes stuff like networking, loadbalancing, scaling and so on. More on these emphemeral runtimes below. Even though it is still quite early on in the world of Serverless architectures it seems the FaaS definition of Serverless architecture is gaining more traction than the mBaaS definition. This doesn’t mean mBaaS does not have a valid right of existence, just that it’s association with Serverless architecture is faining away. When looking not just at Serverless architecture, but also other fairly recent trends in IT, we’re looking at you Cloud, Microservices and Containerization. We can detect a “evolution of runtimes”. From one to many runtimes. Traditionally you had one gigantic server, virtualized or bare metal where an application server of some sort was installed to. And on this application server all applications, modules and or components of a system would be deployed to and run. Even though these application servers where usually setup in multiples to at least have some high availability further scaling and moving around these often called monolithic runtimes was hard at best and downright impossible at worst (looking at you mainframe!). Recently a trend emerged to not only split complex monolithic systems is autonomous modules, called microservices, but also to separate these microservices further by running them in a separate runtime. Usually a container of some sort. Thow in some container orchestration tool like Kubernetes, or Docker Swarm and all of a sudden scaling out and moving around runtimes becomes much much simpler. 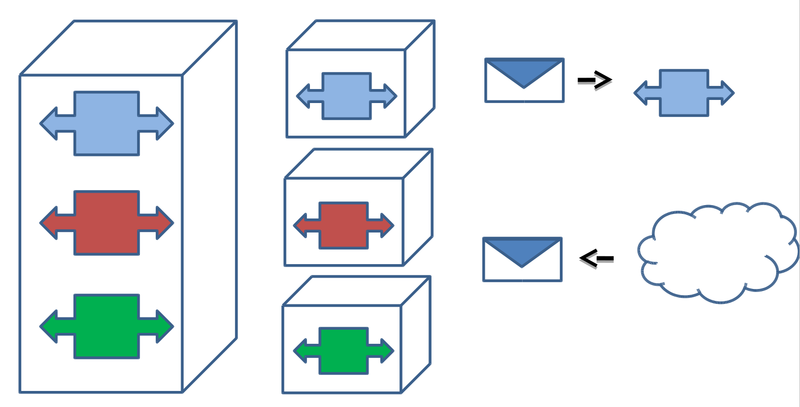 Every application is neatly separated by others and specific requests or messages for a particular app are handled by its runtime (container). The next step in this evolution is what Serverless architecture and FaaS is all about. When a container runtime handles all requests of the app it is serving a FaaS function or app runtime handles only one request and turns itself off after the function completes. This turning off after every invocation has a couple of characteristics which defines a Serverless architecture. No “Always on” server – when no invocation requests are being handled and a traditional runtime would be sitting idle a Serverless architecture simply has nothing running. “Infinite” scalability – since every request is handled by it’s seperate runtime and the provisioning and running of these FaaS functions is handled by the (Cloud) provider it provides a theoretically infinitely scalable application. Zero runtime configuration – the configuration of your application server, docker container or server is completely left to the (cloud) provider. Providing a “No-Ops” environment where the team only has to worry about the application logic itself. You can compare it with modern cars which turn off the engine while waiting for a traffic light. When the light turns green and the engine has to perform it starts. When the car is idling it simply turns off the engine completely. 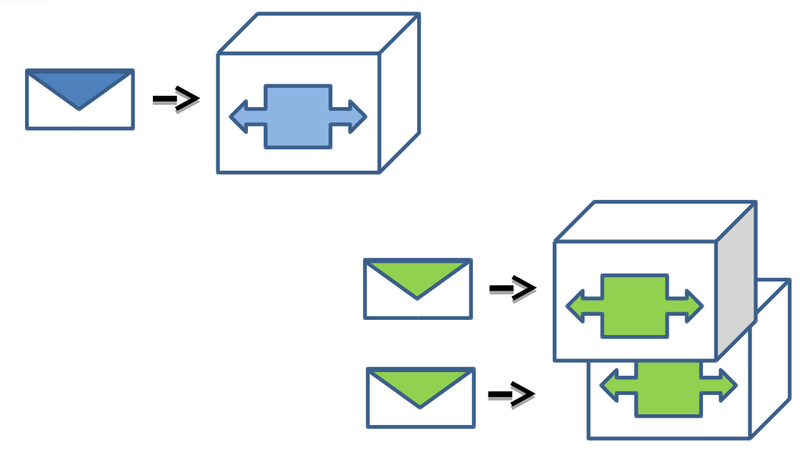 Since every request is handled by its own runtime scalability is handled out of the box. As of the writing of this blog the three largest commercial offerings for implementing a Serverless architecture are available from, not surprisingly, the “big three” of cloud providers. Not suprisingly the specific Serverless offering is completely integrated with all other cloud offerings of the particular provider. Meaning you can invoke your FaaS function from various triggers provided by other cloud solutions. With probably the most unpronounceable acronym in the world of IT, and there are a lot, HATEOAS is also one of the most obscure and misunderstood constraints of the REST specification. In this article I will make an attempt to shed some light on the world of hypermedia and HATEOAS. Let’s start with listing the complete list of the constraints of REST to give us some context on where the HATEOAS constraint sits in the REST constraints. As we just saw in the list of constraints HATEOAS stands for “Hypermedia As The Engine Of Application State”. So, what does this mean? To grab the concept it’s helpful to think of a regular webpage. When browsing to a page there are, most of the time, various hyperlinks available which you can use to navigate further to other pages. These pages are essentially the “state” of the web(application). So in essence the states are the various webpages and the transitions to the different states are the hyperlinks. 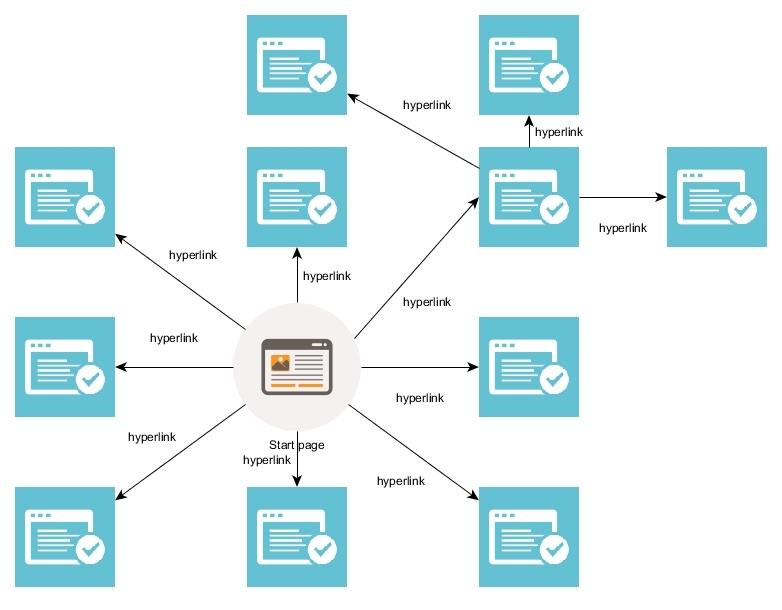 The hyperlinks are the “engine” to which the state transfer can occur. Above we see a diagram of various webpages, when starting to browse the internet we start at an initial starting page. Clicking links on this starting page we can browse to other pages. Except from changing the URL manually in the browser address bar, the pages we can open via hyperlinks are dictated by the first page itself. 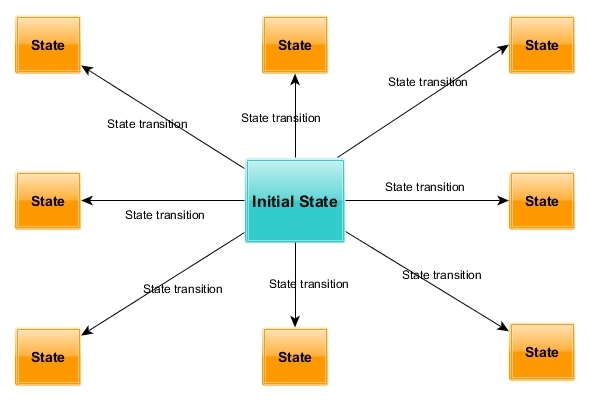 The state transitions are controlled by the web application. This is an important concept in HATEOAS as well. Also the endpoints are hidden from an end user perspective. So… how does this applies to REST and HATEOAS? The way to implement HATEOAS is pretty straightforward: in each response message add the link(s) for possible next request messages. Therefore give the opportunity to the consumer of the REST service to transition the state via the links in the response message. In our simple example response we request the stock information for ACME. We get the price back, but in addition the links to either buy or sell the stock. So when we add links to our responses does that mean we are now truly RESTfull? But, are we truly RESTful if we include hyperlinks in our responses? The thing is, people do not use REST API’s. People use apps and sites and those apps and site use those REST API’s. So what does this mean? It means that if the app or site developer chooses not to use the HATEOAS links in the response the end user cannot state transition using hypermedia and ergo we are not truly HATEOAS compliant and thus RESTful. So, adding the links in the responses is an important step in HATEOAS and RESTful compliant, it is only the first step. HATEOAS is one of the more misunderstood and forgotten REST constraints. I hope this blogpost will help you in better grasp this REST constraint.